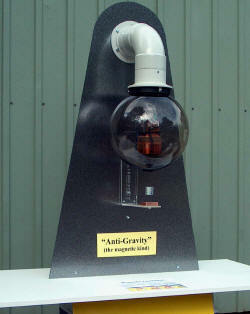 Magnetic levitation Mk I I am working on potential exhibits for the Gravity Discovery Centre in Gingin, Western Australia, as part of an 'antigravity' display. The GDC is the public interface for the Australian International Gravitational Observatory which is part of a worldwide effort to detect elusive gravity waves. It works! (After a week of adjusting and testing) A NIB magnet with some metal pipe is supported motionless, 1 inch below the coil. "..look Ma, no hands.."
The left photo shows the coil and earlier circuit board. The other two are of the neat side and the not-so-neat side. Alright, so I don't know how to do PCB's. The coil will draw 10 A at 13V and is wound on an old solder bobbin. 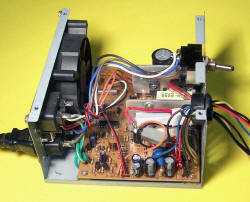 In operation, however, the draw is less than 2 A at 12 V. The drive circuit uses three LM324 quad op amps (of which 9 of the 12 are used) and a dual 555 timer (NE556). 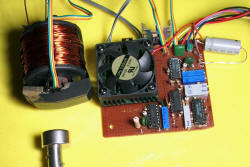 This drives a IRFP450 MOSFET rated at 500V 14A under the CPU cooler fan. There are two BYV29 500 V, 9 A, 60 nS diodes to absorb the back EMF when the coil switches off. 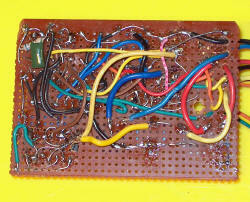 The circuit comes from Rick Hoadley's excellent magnet site. I have made only minor modifications including reducing minimum pulse width from 4 to 1 uS and using the MOSFET instead of an IGBT. This is a standard 200 W ATX computer power supply which is 7 years old. 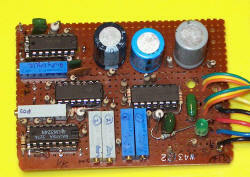 It supplies +12 V 8 A (yellow wire), -12 V (blue) and +5 V (red). It has been modified to include a power switch on the back panel and a divider across the 5 V line with a 24 ohm and a 10 ohm resistor in series. This allows some load for the 5 V line (? need 0.1 A) plus a 3.3 V reference for the orange lead which normally senses the computer board voltage of 3.3 V. I did blow out the first supply I used but no problems since this modification which also powers the LED through a 100 ohm resistor from the 3.3V line. I have tidied up the leads into one multicore cable terminating in a 25 pin plug. In action with a fancy mount and fitted into a suspended PVC pipe with all the wires tidied up, it can support a dish with 110 g of sweets. (This was for a lunchtime demo). It worked OK but unfortunately I left it running inadvertently for some time and the electromagnet melted through the end cap. Ooops. Remarkably the Hall device and the electronics were unharmed. Now time for a serious coil. This was made from an x-ray ballast transformer. 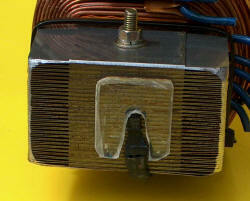 The rectangular core was taken apart and changed to a solenoid core with enlarged ends. Fortunately the laminations weren't fixed and were suitable to do this. The iron core at 4 x 4 x 17 cm has about 20 times the volume as the previous coil and with the much higher number of windings, gives a much more efficient coil. 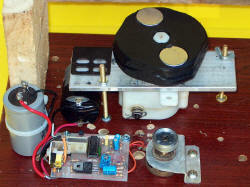 It runs at 60 V at 1 amp (= 60 W) at rest supporting a NIB magnet 3 inches (8 cm) below the electromagnet coil. At full power it draws 40 V 6 A (= 240 W). 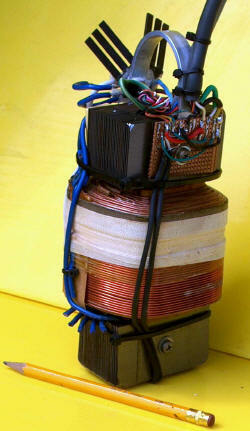 This power is supplied from a separate mains transformer. Total weight is 10 pounds (4 kg). Total levitating lifting power is around 2 pounds (1 kg) but it will be supporting a NIB magnet weighing 160g measuring 1.3 inches (3 cm) diameter x 1.3 inches (3 cm) deep. 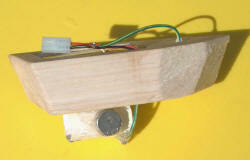 Mounted on the coil are the two Hall effect devices (one end is shown on the right connected to shielded cable). There is a thermal cutout not shown (microwave ovens have lots of these rated at 145 - 160 degrees C). Also not well shown are a 0.22 uF 250 V polyester capacitor and a freewheeling BYV29 500 V, 9 A, 60 nS diode and heatsink to constrain the RF hash locally. 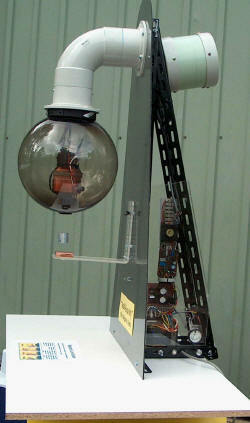 This shows the mounting inside a 12 inch (30 cm) acrylic sphere, with a high flow centrifugal fan supplying airflow through the PVC above it. 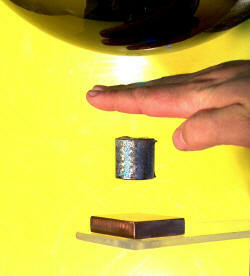 Without the copper block beneath it, the magnet tends to oscillate and become unstable after perhaps 10 seconds or so. Despite my best efforts to counter this electronically, the most effective way to dampen it is to have a heavy aluminium or copper block beneath it about 1 inch (2-3 cm). This still gives an effective display and you can spin the NIB magnet or have it completely in your hand still levitated and resisting being moved away. Giving the magnet a simple spin with the fingers will keep it rotating for 1 1/2 hours limited by friction and eddy currents. 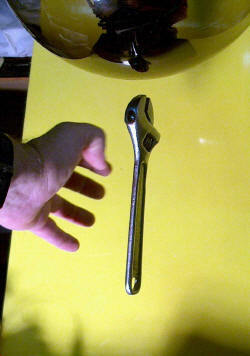 It will also support an iron object such as a spanner without a magnet as above. The control electronics are essentially the same but I now use two paralleled MOSFET's on a larger heat sink for extra power handling. The single control is for control of power and hence position. Adam Kumpf's project with mathematical descriptions of the instability and the simple correction for this. 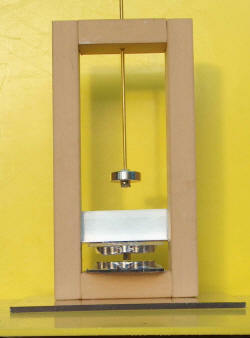 The Levitron (R) is a small spinning top like magnet that is fully hovering in mid air unsupported. It is rather critical in its dimensions and operation and is adjusted by very small weight changes. It is commercially made and sold as a toy. See their site for details. I have tried to make, one unsuccessfully as yet, with the arrangement below. Here the magnet is supported in a stable position just above equilibrium. Any lower and it will fall over. 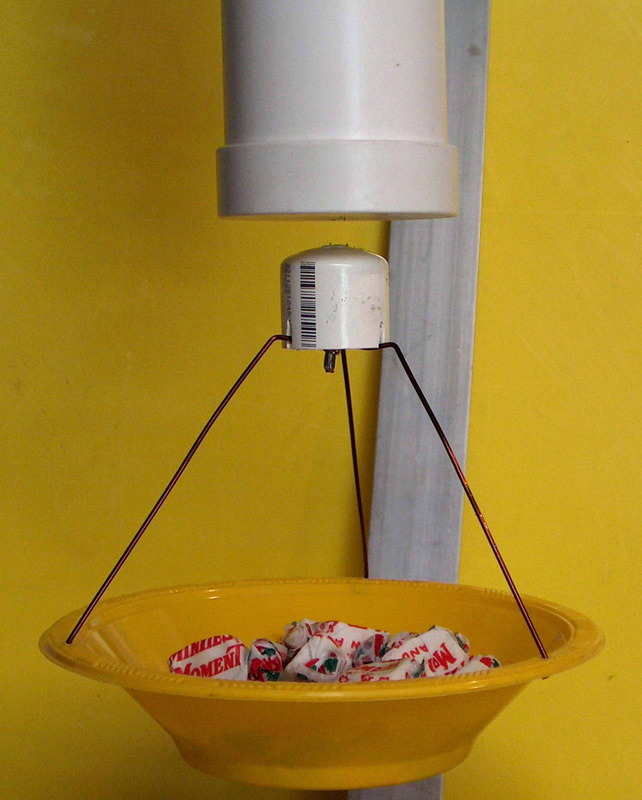 If it is spinning and all parameters are correct it will hover in the air. I have used a motor to spin it to find a zero balance position but haven't really spent a lot of time on it. Arranging a stable spin as a simple top is the first challenge due to the multiple components (nylon nuts and bolt, acrylic disc and toroidal magnet. I have used a nylon screw but it is very hard to machine as it bends and slips. Probably machining one from something hard like polycarbonate would be better and mean there is only one shaft, disc and magnet support and symmetry is more assured. 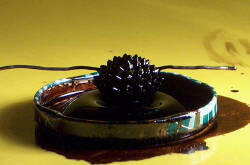 Ferrofluid A bizarre fluid that is magnetic made of nano sized magnetite particles. The really weird thing about it is the tendency for the fluid to form stable 'spikes' in a strong field. These will change with the magnetic field leading to different patterns of spikes as the field interacts. The left photo shows the ferrofluid with a small upright cylindrical magnet within it. (it fell in when a test tube containing it smashed). Beneath it is a larger NIB magnet with a broader field. On the right photo a length of solder passes through the liquid without resistance. In fact not quite without resistance. The non magnetic solder displaces the magnetic ferrofluid resulting in a small diamagnetic force on the solder. 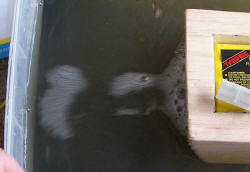 Things look really strange when the fluid flows up onto a suspended magnet. This stuff cost about AUD$80 for 100ml from the US. It is black and oily and will stain things readily. More photos once I clean up the mess from the last lot. My black stained hands made me look like a mechanic. 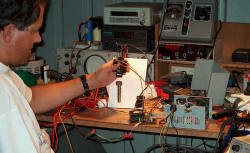 On the left is a device to rotate 2 NIB magnets at a variable speed using a MOSFET controller. This sits under the tray with the ferrofluid. On the right is a static image of the double lobed field from the two magnets. You can see me taking the photo in the central reflection. When there is enough rotational speed, ferrofluid waves are generated with the rough analogy of gravity wave generation from rotating binary black holes. When ferrofluid is placed under water there is little difference in the spikes, however when detergent is added the surface tension drops and the spikes become fine and elongated, more like iron filings. There are some really unusual effects such as water dripping DOWN from a NIB magnet at the same time as ferrofluid drips UP. Has to be seen to be believed. This is an electrical propulsion method with no moving parts which applies to any conductive fluid including water, liquid metal or plasma. 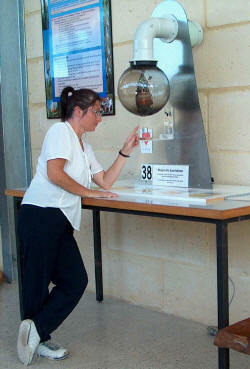 Here I am demonstrating the principle with water. Essentially two electrodes in water have a current passed between them in a magnetic field and the water is forced out the back creating thrust. It is not really a commercial proposition but was featured in "The Hunt for Red October" as the Soviet stealth sub. In my model there are two 1 inch NIB magnets about an inch apart. 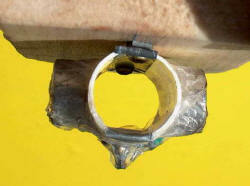 At right angles to this are two electrodes which pass about 1.6 A 9.6 VDC in salt water. ie about 15 watts. Power is by a model car NiCd pack. 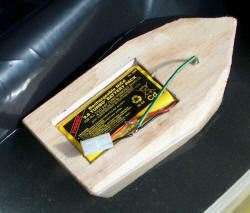 The whole decidedly unseaworthy construction is made of Balsa and is about 8 inches long. Performance is underwhelming and I would guess at 1cm/sec boat speed. Using off board power of 1kW (100V 10A) there is a lot more action and production of hydrogen and ?oxygen or chlorine bubbles streaming from the stern, but I don't have a big enough tub of saltwater to test it for speed. 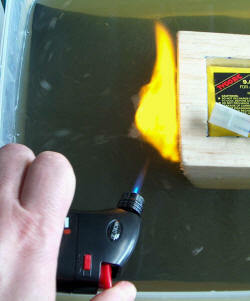 On the right is the ignition of the hydrogen bubbles with the bright yellow flame from the sodium in the seawater bubbles. Normally a hydrogen flame is almost colourless. After a short while the electrodes wear away and the water fills with debris, presumably insoluble salts of the metal electrodes. For more information try this site. I have finally found the description of the Japanese MHD boat, the "Yamoto" made by Mitsubishi in the 1990's and weighing 185 tons. It uses a superconducting 4 Tesla magnet, and the round cross section of the motor looks remarkably like mine but about 10times the diameter (260mm). Electrodes are Titanium with anode coating of DSA (?) 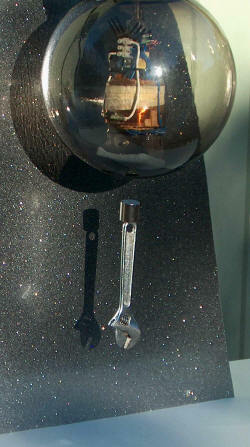 and the cathode plated with Platinum. The length of electrodes is 3.4m. Fascinating article with lots of diagrams. Note that these aren't all around the place so I guess propellers aren't out of business yet. 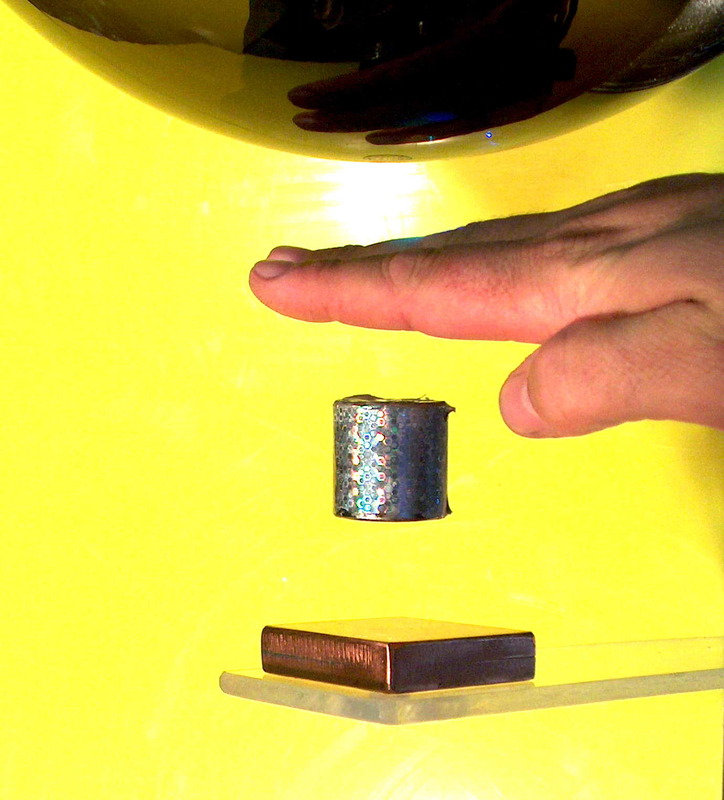 Diamagnetic levitation A classical setup with a small cube magnet between two Bismuth plates. A large magnet well above provides the lift and a fairly uniform field and the Bismuth plates help stabilize the area locally. Without the diamagnetic repulsion (or other tricks), Earnshaw's theorem states that this cannot be stable. Note that this is permanent levitation without external power as used above. 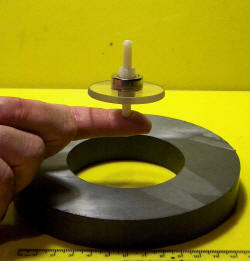 The magnet rotates freely and is quite stable in the centre. 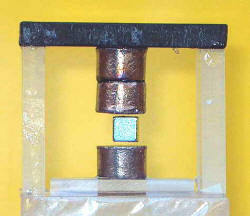 I have used 3 small Bismuth cylinders as below for levitation of a small cubic NIB magnet. I have also used about 200g of Bismuth as 19 small cylindrical pellets in rows above and 19 below for large magnets but to levitate successfully the field needs to be uniform and the main lifting magnet needs to be larger and further away. They are fixed firmly with ... tape.